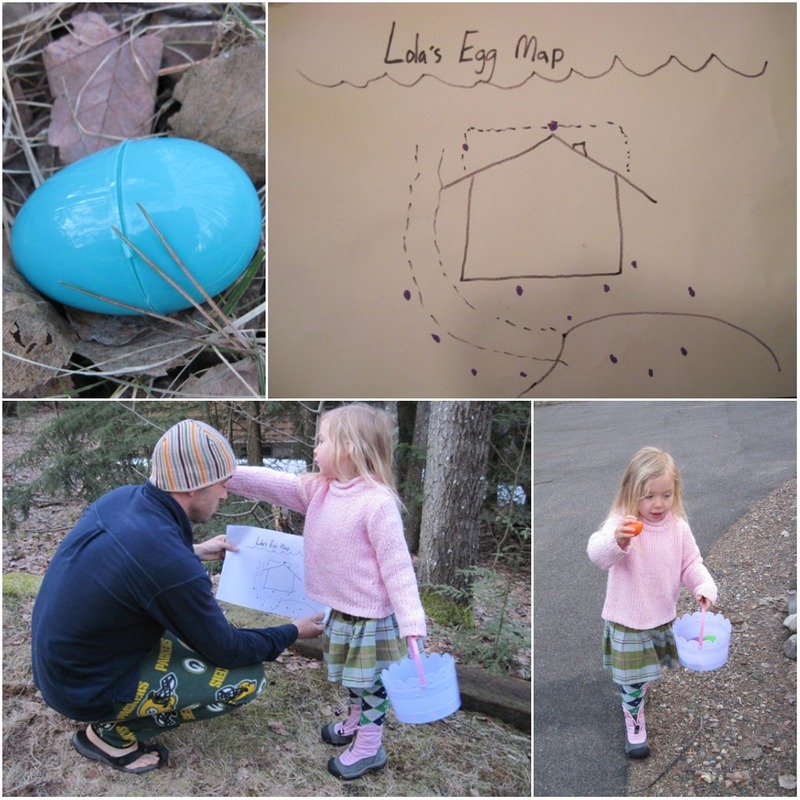 Easter Sunday brought us eggs, treats, and sunshine. Glorious, beautiful, warm sunshine. For a moment there, it seemed spring had sprung. In the spirit of Easter and resurrection, the flowers I have been staring out of the ground for the last few weeks have finally surfaced. 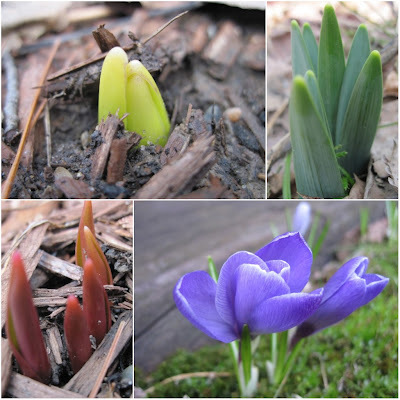 Tulips, hyacinths, daffodils, and crocuses are peaking from the dirt. Like us, they must be pleased to feel the warmth of the sun after all that snow. I haven’t had the heart to tell them more snow showers are predicted for the middle of the coming week. I too, am in denial. After we returned from a few hours in Rhinelander to pack up more boxes, the three of us dug a few lawn chairs out of the basement and carried them around to the sunniest spot in the garden, just off the garage. Ryan and I basked in the sun, sipped from our cocktails, and watched Lola ride around on her bicycle all afternoon. We ended the day down by the lake. Warming up by the side of the impromptu bonfire Ryan and Lola built, we watched the sun set on the lake and the stars come out. A little James Taylor in the background topped it off. Several geese joined us while dozens more flew in overhead, loudly announcing their return to Lake Lucerne. With every birthday comes a doctor's visit. 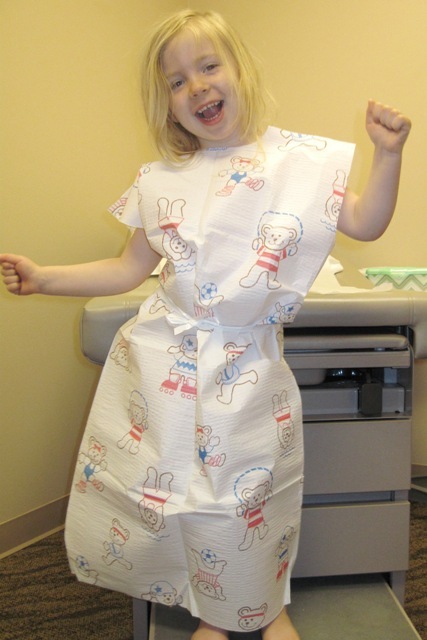 Last Thursday Lola and I visited with her pediatrician for her four year old check up. She was so excited, she had been asking me all week when we were going to the doctor. The visit went fine, for the most part. She is growing as she should and everything functions as it should. No surprise there. It ended with the final round of her vaccinations. When I told her she was going to get some shots, she enthusiastically asked if she was going to get a band aid? Why, of course! Two nurses came in to administer the vaccinations, four in all. While I held Lola's elbows, they stereo poked her. Lola sat up when she felt the first pokes but held it together. But the last one, the MMR, was a mean one. That one really hurt. Poor girl. Not even the toy stethoscope the nurse gave her when it was over could console her. When I asked her if she was mad, she answered: "No. I am sad." When I dropped Lola off at daycare this morning, her teacher and I talked about her not quite so festive birthday party this Saturday. Miss A. told me it was the start of Spring Break and lots of people were going out of town. I did not know that. My bad for poor planning. It is still no excuse for not calling, though. One of the no-show mothers overheard us and explained why her daughter wasn't able to make the party. "It would have been nice to know that so I could have prepared Lola for no-one showing up," I shot back and gave her a dirty look. "Oh," she replied. Filled with resentment I walked out of the daycare, got in my car and left. A few minutes later at the traffic lights, I pulled up behind a car with LVG NRGY on her license plate. I am assuming the driver was a she, I don't think many men up here are prone to driving around with Loving Energy written on their cars. It made me smile. I took a deep breath and all my anger flowed right out of me. The universe was talking to me again. Thanks for the reminder. Lola's birthday party was today. For the first time she invited her own friends to celebrate turning four with. 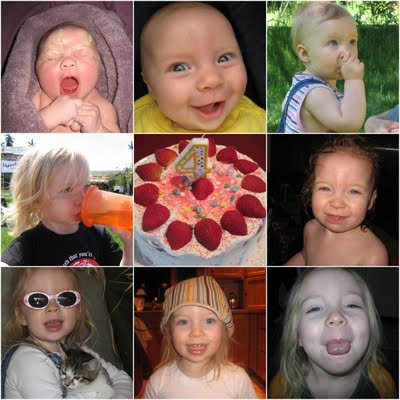 I wanted to do the Waldorf thing and invite the same number of friends as her age, four. Turns out I was wrong. The total number of the party should have been four, according to Rudolf Steiner. Lola on the other hand, invited all of her friends. In the end it didn't matter because only one friend showed up. Lola was disappointed, of course, but I am downright heartbroken. And angry. I am very upset with the mothers of three of her friends (one mother had called and canceled because they were going out of town for a family visit). How can they do this to a little girl? Just this morning we ran into one of her friends and her mother at the Y. That mom had called to let me know both she and her daughter were coming, sending me into a frenzy to purchase some adult snacks in addition to the toddler stuff. And then she doesn't show or call. I just don't understand. Nor do I know what to do about it. I will most likely end up ignoring it. But truth be told, I would really like to give these people a piece of my mind. Ryan is ready to take the day off and wait for them outside Lola's daycare. I'll tell you one thing. I feel a lot less sad about leaving Rhinelander and sending Lola to yet another daycare/preschool. Ryan is visiting with his parents in Arizona at the moment, enjoying some lovely summer weather. We spoke earlier today and I told him it is cold here. The wind is blowing hard, I am waiting for the power to go out, and tomorrow we are expecting three to five inches of snow. That made him happy. I'll bet. Just last week it was the other way around. I was basking in the Arizona sunshine while he was stuck in winter. 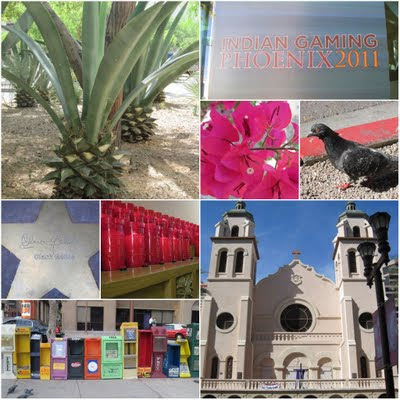 I was in Arizona for the annual National Indian Gaming Association's Conference and Trade Show. This was my second time and it was better than last year. I met some old and new business contacts, watched my old boss win a Harley Davidson, and participated in some very interesting workshops. But most of all, I enjoyed the weather. Walking in Phoenix in the warm evening breeze reminded me of my vacations in Spain during my high school and college years. Pasty white skin, dolled up for an evening on the town, we would wander the streets of Blanes or Malgrat de Mar and enjoy the warm weather and the local charm. The Arizona locals complained it was cold outside one morning, a lovely 70 degrees, forcing me to pipe in and tell them they don't know what cold outside is. Downtown Phoenix is a strange mix of old and new. Of European architecture, Latino architecture, and modern office and hotel buildings, rising above everything else. The vivid pink and red flowers and fresh green trees brighten up the drab colored buildings. The strawberries taste sweeter in Arizona, I found. The cars are nicer, classier, and cleaner. Phoenix is a very clean city. Surprisingly so because I had a very hard time finding a trash can on the streets. We're back in Crandon. Again. Living with my in-laws. Again. This time it was not the lack of employment opportunities that chased us away. No, we have left our house in Rhinelander because of mold. Dangerous levels of mold. A couple of months ago, our basement flooded as the result of a burst pipe. Our landlady V. has not exactly been on top of fixing things, to put it mildly. The waterpark was handled quickly enough, but restoring things to the way they were has taken almost two months. We would call her every now and again, to let her know the carpet was still a mess, the base boards were still missing, and mold was starting to form. Then the family room started to stink. To the point where you would hold your breath when you walked through it. We decided to do a little mold test. And sure enough, we hit a jackpot. When we informed our landlady, she told Ryan she was sending over some friends to assess the situation. As it turned out, her friend was a former health inspector and as soon as he walked in the door, he cried out: "This place reeks of mold! You have to leave, this is dangerous." And so we did. Well, I didn't do anything, I was living it up in Phoenix while all this went down. Ryan's parents kindly instructed their plumber to de-winterize their house and offered it to us. Ryan packed up Lola, Sandman, and a few other necessities and off to Crandon they went. In the meantime landlady V. called her contractor again and requested he finally finish up. When we returned to the house on Saturday, the guest room carpet had been cleaned and the family room smelled nice again. The base boards are still missing. Now it could be just me, but fighting mold with a steam cleaner does not make a lot of sense to me. Moisture and warmth? Ideal growing conditions for mold. And that nice smell? Emptying a bottle of Fabreze could have accomplished that. 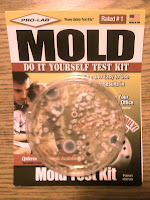 We ran another mold test, in the family room this time, to be sure things had been handled properly. And until we were certain it was safe to live there again, we were staying put in Crandon. When I spoke to V. to let her know of our plans she told me her friend felt he had exaggerated the smell. 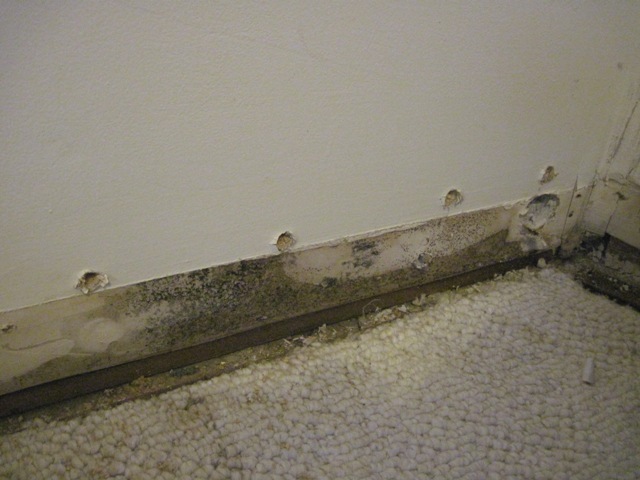 It wasn't really mold, it was probably just the dirty carpet in the guest room. Really? At that moment she lost all credibility with me. And when our little test kit started showing signs of life, we decided to move. Where to? We don't know yet. What I do know is that I am really tired of moving. Really tired. I have far too much crap to be a proper nomad. Happy birthday to my beautiful, funny, charming, mischievous, smart, outgoing, cool, imaginative, creative, and loving daughter. This day is a very special day. Because this is the day you were given to me to care for. You are, and always will be, my favorite little person in the whole wide world! Even though you told me you're officially a big girl now. I love you Lola, with all of my heart! When I traveled to Palm Springs two months ago, the Midwest was hit by the Storm of the Century, shutting down the region entirely. 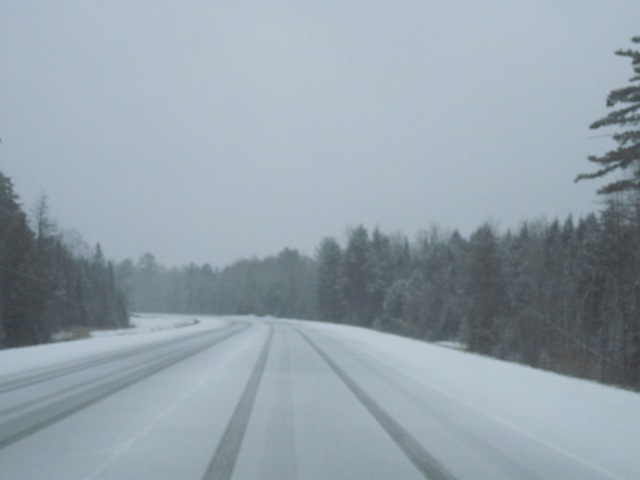 And while Lola and I were enjoying glorious spring weather in Holland recently, the Northwoods were treated to a whopping fifteen inches of snow. In a few hours I leave for Phoenix where the temperature is a balmy 85 degrees. True to form, I leave Wisconsin looking like a winter wonderland once again. My fellow team members have requested I do not leave the state anymore.